The mighty Blueberry Cake with Quark Cream is light, delicious and an absolute must in our household every September. Super easy to make! Preheat oven to 175°C. Line a cake tin (26 cm diameter) with baking paper. For the spongecake: In a bowl add whole eggs (shelves removed), 75 g sugar, salt and orange juice (about 2 table spoons or juice from 1/2 freshly squeezed orange). With a mixer mix on high for about 7-8 minutes, until the mixture gets fluffy and foamy. Then, sift 100g of flour with baking powder on top and gently fold the flour into the mixture with a spatula. Be gentle so as to keep the mixture light and fluffy. Pour the mixture into the baking tin and place in oven. Bake for about 20 minutes. Check if the spongecake is done by sticking a toothpick into the cake. If the toothpick comes out clean, your spongecake is done. Remove from oven and set aside to cool down completely. Once cooled, remove the sponge cake from the baking tin, remove the baking paper and place back into the cake model. With a toothpick poke plenty of holes into the cake. Take half a glass of water, add a spoon of sugar and dissolve it. Then, with a spoon, wet the sponge cake with the sugared water. For the cream: Soak gelatin sheets in cold water as per instructions on package. Squeeze juice from 1/2 orange and grate peel (make sure to use organic!) In a bowl add the smooth quark, yogurt, sugar and grated peel. Mix well with mixer or by hand. Divide the quark cream into half. In a bowl, pour whipping cream and with a mixer or by hand whip until firm. Blend blueberries in a blender until smooth. Add the blueberries to one half of the quark cream and combine well. Drain 6 gelatin sheets, dissolve them as per instruction in some orange juice and add to the blueberry mixture. Mix in well, and as the mixture starts to firm, add half of the whipped cream. Fold in and mix well, then pour the cream over the sponge cake and smooth it out with a spatula. Drain the remaining 5 gelatin sheets, dissolve and add to the white quark mixture. Mix in well, then add the remaining whipped cream. Fold the cream into the quark, combine well, then pour the white mixture on top of the blueberry mixture and smooth it out. Put the cake into the fridge to cool and firm for at least 3 hours, or overnight. 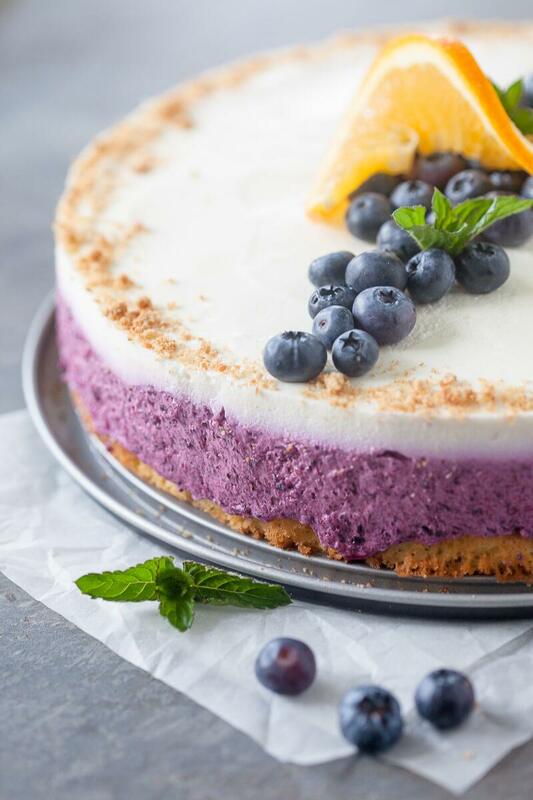 Decorate the cake with fresh blueberries, orange slices, mint leaves and cookie crumbs.